These tacos take minutes to make but are packed full of flavour! Mix all the ingredients for the salsa in a bowl. Cover and set aside. Heat the oil in a large non-stick frying pan over a medium heat. Add the chicken and cook, stirring for 4-5 minutes until just browned. Stir in the seasoning mix and the water and cook, stirring, for 1 minute. Add the kale and cook for a further 2-3 minutes until the kale is just wilted and the chicken is cooked through. Meanwhile heat the tacos as directed on the packaging. 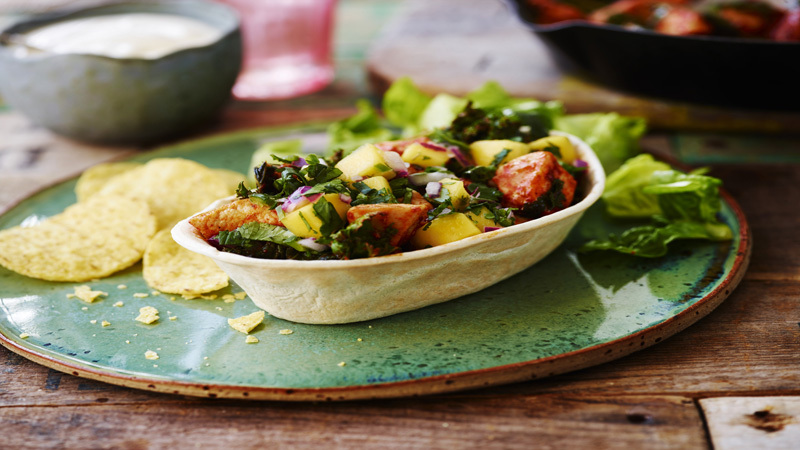 Divide the chicken and kale between the warmed tacos and top with the mango salsa and a dollop of Greek yogurt. Replace the curly kale with shredded green or red cabbage, if liked. Blanch in boiling water for I minute then drain and refresh under cold water before adding to the pan. Serve with a tangy tomato relish or Old El Paso™ Thick ‘N’ Chunky Salsa instead of the mango salsa for a change of flavour. Old El Paso™ Original Nachips™ and a salad are great accompaniments to these tacos.